Vinita was born in Kanpur, India and has lived in several countries around the world. Her family was in Zambia (Africa) for many years. She went to St. Mary's Convent boarding school in Nainital, India, and then to college in the US. Vinita has been deeply spiritual from a young age, with an urge to know the Truth. After a mystical spiritual experience when she was 13, she started meditating and reading spiritual texts from several faiths. 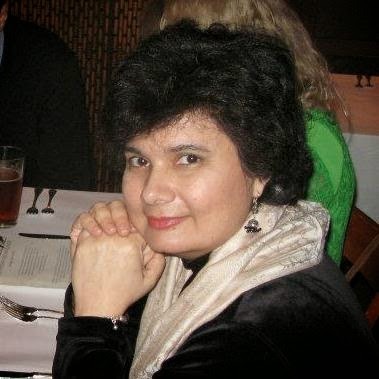 Vinita did her degree from the US in Computer Science with a minor in Comparative Religions. She has studied several religions, faiths, mystical traditions, and ancient wisdom for over 30 years. Her continuous learning in science and spirituality includes quantum physics, Ayurveda, astrology, Yoga, meditation, sound vibrations and new age spirituality. Vinita has published two books. "Eternal Way to Bliss", is based on Vedic knowledge and was published by John Hunt Publishing. Her second book, "Merging with the Beloved – Mystical path to Oneness", on devotion was published by Partridge (Penguin) India. Vinita leads spiritual practice sessions which include meditation, Yoga, Pranayama, chanting, and spiritual knowledge. She also helps others through personal guidance, spiritual support and conducts healing therapy sessions. Vinita received her sound healing certification with internationally acclaimed teacher Jonathan Goldman. Her natural inclination towards chanting, specifically Mantras, has led her to a lifetime of practice and learning from several masters including, Thomas Ashley-Farrand. She is certified in Past Life Regression Therapy, QHHT, training from Dolores Cannon institute. She has been a teacher with the Art of Living Foundation, has taken several courses and practiced for many years. She has also given several talks and led workshops at public events, organizations, community centers, libraries, colleges, and companies for over 15 years. Under the tutelage of the Chinmaya Mission she has studied many Vedic texts including several Upanishads, Gita, Puranas, epics, and advanced texts. She has studied the teachings of Shankaracharya, Vivekananda, Ramana Maharishi, Sri Sri Ravi Shankar, and many others. Vinita has worked in the IT industry for more than 20 years, including management positions in companies such as SAP America. She currently works in IT for a company in the San Francisco bay area. Very inspiring bio. I would love to speak to you. get to know me more you may visit my site www.pathtoanandam.org or my face book page, amazon books, etc. looking forward to hearing from you. satya@pathtoanandam.org. 925-984-6215. Love.